Meet Samantha Sweeting, a high profile lawyer in London with an IQ 158. She works all hours, has no home life, cares only about getting a partnership in the firm she works for. She does not care about her social life or knows any domestic work, not even a basic thing like - boiling an egg or turning on an oven! She thrives on pressure and adrenalin. Finally, the day comes for which she had slogged for 7 years, the day when her partership is going to be announced. But that happiness is short lived. She discovers that she has made an idiotic mistake that will be costing one of the firm’s clients over 50 million pounds. She goes into meltdown, walks right out of the office, gets on the first train she sees and find herself in the middle of no where. Asking for directions at a big house, she is mistaken for the interviewee housekeeper and offered the job. Her employers have no idea they have hired a Cambridge educated lawyer. Samantha has no idea how to clean the house, work the oven, wash the clothes or even prepare a meal, let alone the fancy ones her employers want her to come up with. How Samatha deals with her new job, how she fares at it and whether her old life will catch up with her? That is all 'The Undomestic Goddess' is about. There is a romantic plot as well in the story. All these makes for an interesting plot. But, as you read on, the story becomes very predictable. None the less, it is a very entertaining read, apt to pick it up between serious reads. The novel is meant to be a light hearted read and I enjoyed it thoroughly. 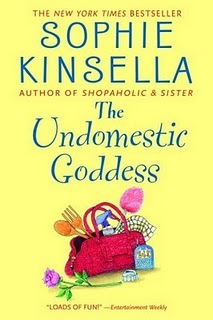 It is the first Kinsella Book I have read and surely I will pick up her famous Shopoholic series sometimes soon in future. Her writing style is lucid, entertaining, witty and full of good humour. One of the best and perhaps the most entertaining chick-lit book I have read in recent times. If you meaning to pick a fun and easy read, pick it up for sure! ;-)! Enjoy! To know more about the author visit http://www.sophiekinsella.co.uk/ . This was my first Kinsella book too & since then I haven't missed a single novel of hers. But if you ask me then I would rate this one much below her Shopaholic series & even Remember Me,..
My favourite chicklit author !I remember njoying this book too. Thanks for your concern.. we were shifting our residence..so every other hobby came to an abrupt stop till we got settled.. nice review..we both share the same opinion.. but yet it was thoroughly entertaining..